Jesús Guillen: As an HIV long-term survivor, I have many beautiful moments, but also some very painful ones. Every day, learning to live and enjoy the moment; a moment after that, I never know. For the instant, a jump of life. 24 hours. 11 countries. 5 continents. 3 foldout covers. This issue of POSITIVELY AWARE features three versions of a foldout cover of photos selected from A Day with HIV, the magazine’s annual anti-stigma campaign that captures 24 hours in the lives of people affected by HIV. 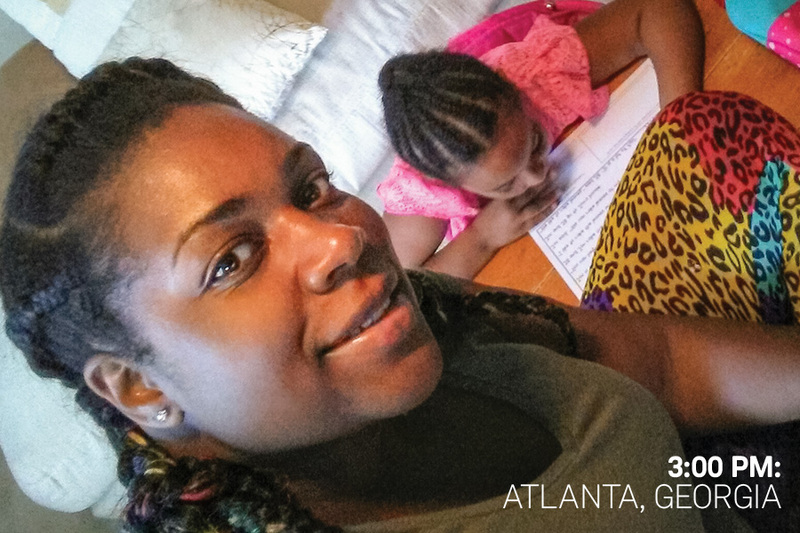 Shyronn Jones: Homework time for my kindergartener. Alessandro Pino, Andre Ampudia, Matthew Phelps, Andres Sosa, Yoel Moreno, Nicholas Ferrera, Alejandro Suarez of Latinos Salud: HIV doesn’t minate; good thing pizza doesn’t either!